Nearly six years have passed since Doug Benson first entered the documentary would with his sleeper hit Super High Me, and in that time the comedian’s popularity has continued to rise. Now, after teasing fans for the better part of a year, Benson has returned to the world of documentaries with a hilarious and engaging look into his life on the road in The Greatest Movie Ever Rolled. Before we dive into things, yes, the film’s title is again a play on the name of a film by documentarian Morgan Spurlock (2011’s Greatest Movie Ever Sold.) Benson has a story about his decision to name another movie after a Spurlock film, which you can hear a portion of in the trailer below. Taking you on the road and behind-the-scenes with Benson during a 2011 tour with fellow comedian Graham Elwood, The Greatest Movie Ever Rolled is 80-minutes of nonstop hilarity. From his travels by car and plane, to selling tickets on the streets of Ann Arbor with a megaphone, to smoking with a group of 20+ fans on the outskirts of Peoria, and beyond, Benson pulls no punches and opts instead to let his true reality play out on the screen for all to see. Some gigs go better than others, and the post-show environment changes as often as the zip code, but each stop has its own collection of memorable people and faces that translates wonderfully to the screen thanks to the direction of Ryan Polito. It’s often my plan in film reviews to go (slightly) in depth about a film’s plot and examine how well the overall execution goes, but in the case of The Greatest Movie Ever Rolled it is best if one views it knowing as little as possible about what awaits beyond the aforementioned premise. Though thousands make a living touring the country, every experience is unique, and this film offers fans of comedy from all walks of life the chance to see how one individual exists while in transit from crowd to crowd and state to state. By the time the credits roll you’ll be doubled-over from laughing, and on repeat viewings it’s likely you’ll feel the same way. The Greatest Movie Ever Rolled is a must-see for all fans of stand up comedy and I cannot recommend enough that you see it as soon as you possibly can. 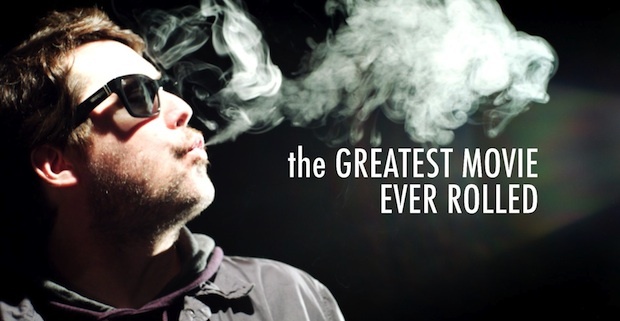 Starting today, The Greatest Movie Ever Rolled is available on Chill for $7.99. Click here to order your copy.